« The Ballad of Mitt Romney or: What You See is What You Get…Get It? One look at his face, and I’m pretty sure it’s not a sexually transmitted one. Enjoy that image in your head! Two words can say soooo much ! Hope all is well, Tony…. Protection indeed, but I don’t think they are selling full body condoms yet. Oh, yes. That IS exactly what he sounds like. hey the two men in black following you…. are they still there.? I agree with Soma – you’re gunna need protection! 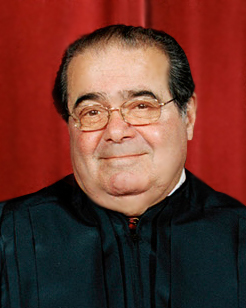 I’ve never heard of Scalia but I DON’T LIKE HIM!! I rely on you, Tony, to give me the heads-up on all the scum.